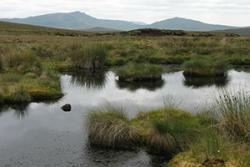 A typical upland wetland. : Inage credit: Mark Cooper.Wetland scientists from Bangor University have featured in a BBC show on one of Wales’ most important habitats. Two members of the Bangor Wetlands Group at the School of Biological Sciences appeared on BBC Radio Wales’ popular Science Café series. Prof Chris Freeman and Dr Christian Dunn spoke to the programme’s host, Adam Walton, about the importance of the Migneint – a vast area of blanket bog in North Wales. “It was great that Adam and the Science Café team were interested in seeing the Migneint. “These areas of peatlands, which literally blanket some of our mountains, often get overlooked but they’re incredibly important wetlands for a whole host of reasons. 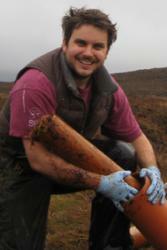 Dr Christian Dunn collecting samples on a bog. “It’s always good to show people just how important our peatlands are and to highlight some of the work we’re doing here at Bangor University on the subject. “It does obviously rain there quite a bit though; fortunately the weather was great when the Science Café came so they had a great day exploring the site and no-one got their feet too wet!” he added.